Nintendo Trademarks "It's On Like Donkey Kong"
Nintendo hopes to own a popular phrase used to let people know that things are getting serious. 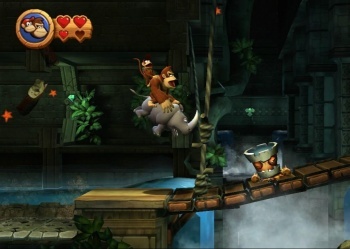 Nintendo is being really clever with its promotion of the upcoming Donkey Kong Country Returns for the Nintendo Wii. The company previously piled up 7000 bananas in a jungle lounge, and now it's filed a trademark for a widely used phrase related to the giant ape. Nintendo has put in an official request with the U.S. Patent and Trademark Office so that it can own the term: "It's on like Donkey Kong." The phrase's origin is impossible to determine, but it's been used in popular culture for years in everything from movies to rap songs. Saying "It's on like Donkey Kong" means that something serious is about to go down. Someone using the phrase could be about to engage in a pie-eating competition, climb a mountain, or jump over rolling barrels while running up girders to save a woman from an ape. Its meaning is universal to whichever situation someone chooses to use it in. But can Nintendo really trademark it? I'm no lawyer, but it seems dubious to me. The phrase has been used so many times in so many places that I don't see how Nintendo would be able to own it just because they own the name "Donkey Kong," but I suppose it's possible. In my opinion, Nintendo is filing the trademark as a publicity stunt so that people know Donkey Kong Country Returns comes out on November 21, a day that the company says it will be "on like Donkey Kong" in a recent press release. Just be careful using the phrase in the future, you don't want to be crushed by Nintendo's trademark enforcement apes. Check out The Escapist's hands-on of Donkey Kong Country Returns from the New York Comic Con to see what the hubbub is about.